What Is a California King Mattress? A California King mattress is four inches longer than the standard king mattress, making it the longest commonly available mattress on the market. A California King mattress is also four inches narrower than the standard King sized mattress. The standard dimensions for a California King, also known as the Western king mattress, are 72” by 84”, whereas the standard king mattress’ dimensions re 76” by 80” or almost square. If you’re tall, the California king mattress is the least likely mattress to leave your feet dangling in the air. In general, you want the California King if you or your partner is over six feet tall.If you’re in an adjustable bed, the California King typically lets you have plenty of length even if one size of the bed is elevated. When a California King is placed in a long narrow room, you have more space to walk around it. There isn’t as much space on this bed for couples who are sharing it. If you’re tall and obese, this bed may not be as good a fit as you’re hoping it is. 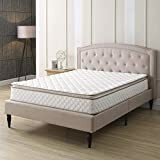 Because these mattresses are not as popular as standard king mattresses, you may have trouble finding a style you like, whether a water bed or built in mattress topper. Sheets, comforters, mattress covers and similar accessories are harder to find for this type of mattress. In most markets, California King mattresses cost about as much as traditional king mattresses. What you may pay more for, on average, are the sheets, headboards and frames. Sheets for the California King are easier to find on the American West coast than elsewhere. Otherwise, choosing this type of mattress limits your selection. You can find split California king beds just as you can find split traditional King beds. Again, the supporting accessories are harder to find, raising the overall cost. Now that we’ve explained the pros and cons of a California king mattress, we’ll provide a list of the best California king mattresses on the market today. This is a basic and quite affordable pillow top mattress. At ten inches thick, it fits in nearly every California King frame. It is made with traditional tempered steel coils. However, the padded layer on top of them ensures you never feel the coils underneath. It has moderate firmness. The outer layer is resistant to allergens and bacteria, though it won’t resist biological stains. The mattress doesn’t come with a frame or base. But unlike the hybrid memory foam / pillow top mattress by this manufacturer, there is no chemical smell. This is a cheap, basic but eco-friendly mattress. It is an eight inch thick California King mattress. It has a thin Green Foam layer to reduce pressure points for sleepers. It comes with an already assembled “Euro Top” mattress for extra softness. The side benefit of this layer is that it extends the life of the springs. A major benefit for many customers is its light weight, just forty pounds. For apartment dwellers, this may be the mattress you can actually get up the stairs by yourself. It is also an excellent option for those who want a thin mattress so that the King mattress on an elevated frame to create under-bed storage isn’t insanely high. This California King mattress comes with three inch thick gel foam to provide support and comfort all year round. The thicker the memory foam layer, the softer it is. The air flow in this memory foam mattress eliminates the problem of overheating that comes with other memory foam mattresses. The durable four layer construction means it will last for years. It provides serious levels of support, though this mattress isn’t recommended for someone who needs an ultra-soft mattress. This mattress comes with a machine washable cover. The cover has a built in zipper to keep it in place until you want to remove it. However, it doesn’t come with the foundation – that you’ll need to get separately. 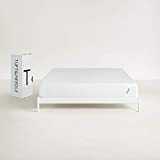 Tuft & Needle Cal King Mattress, Bed in a Box, T&N Adaptive Foam, Sleeps Cooler with More Pressure Relief & Support Than Memory Foam, Certi-PUR & Oeko-Tex 100 Certified, 10-Year Warranty. This California King mattress is made entirely from adaptive foam, an upgrade from memory foam, and you pay a premium for the privilege of owning it. The adaptive foam provides more support for those with aching joints than conventional memory foam. It is better for those who sleep on their stomachs or backs than side sleepers. However, this mattress is cheaper than the average “adaptive foam” mattress; this is why it was rated a Best Buy by Consumer Reports. The mattress is shipped rolled up and needs up to three days to full decompress. One risk you take with this mattress is that it doesn’t fully decompress, leaving you with a lumpy or lopsided mattress. A benefit of this model is that it is cheaper and easier for the manufacturer to ship. One benefit of this product in and of itself is the fact it absorbs shocks and jolts, so that one person getting in and out of bed doesn’t disturb the other. The mattress retains body heat well, so it is a good choice if you live in cold climates but a bad choice if you’re prone to overheating at night. This mattress comes with a ten year warranty. 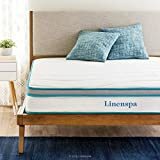 The LinenSpa hybrid California King mattress combines a layer of memory foam with an inner spring mattress. The intent of the design is to eliminate the need for many customers to buy a separate memory foam mattress topper. The built-in one and a half inch layer of foam is underneath the quilted top layer, reducing the risk of biological messes sinking in and stinking up the bed. Note that if you are prone to accidents, you’ll want a bed cover. The combined layers are about eight inches thick, and the mattress itself is quite reasonably priced. The mattress does get somewhat compressed for shipment, but the odds that it expands unevenly are far less than that of mattresses made entirely from memory foam. The manufacturer has a basic ten year warranty for its mattresses.